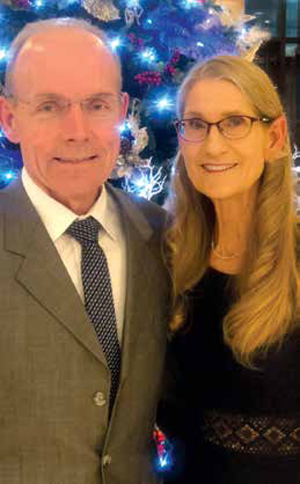 Bob and Debbie Lumpa are leaving Saudi Aramco after more than 38 years with the company. Dhahran — Robert “Bob” Lumpa, assistant to Saudi Aramco executive director of Chemicals Olivier G. Thorel, is set to leave the company after 38 years of service. The Iowa native started his Saudi Aramco career in ‘Udhailiyah in 1980 as a plant engineer at gas-oil separation plants (GOSPs), seawater injection plants, and nonassociated Khuff gas well facilities. From 1986 until 2000, he was supervisor of Operations Engineering at ‘Uthmaniyah. In 2000, he became general supervisor of Operations Engineering in Southern Area Oil Operations (SAOO) before taking the role in 2001 of assistant to the vice president of SAOO. Lumpa moved on to become the assistant to the head of Chemicals admin area in 2009 and has served in that role until the present day. Bob has been married to Debbie Lumpa since January of 1981. They have two sons — both in the U.S. — Craig (29), married to Ripley McKeon since 2015, and Mark (26). Craig is a project manager in Dallas, Texas, and Mark is a financial adviser in Jacksonville, Florida. Debbie taught in the ‘Udhailiyah and Abqaiq schools from 1981 to 2010, when they moved to Dhahran. In Dhahran, she worked as a substitute teacher in the Dhahran Hills Elementary School. Bob was a Little League baseball coach in ‘Udhailiyah, Abqaiq, and in Dhahran when his sons were playing, coaching on two teams that went to the Little League World Series (2000 and 2002) and managing another (2001). Debbie served as president of the ‘Udhailiyah Ranch Association, was a coach for the ‘Udhailiyah youth swim team, and served as a stroke and turn judge for Saudi Aramco and national swimming events. The couple plans to retire to Ponte Vedra Beach in the Jacksonville area, involving themselves in volunteer work for their new community, as well as traveling to see friends and family. Bob said he and his family have witnessed many changes over the years, recalling when there was open desert between Dhahran and al-Khobar. Debbie has marveled at the shopping malls and hotels and restaurants that are now available — a big change from the old Al Shula Mall and Shwarma stands on the streets. The couple noted living and working at Saudi Aramco brought great memories of not only community activities, but also traveling to places such as al-Hasa and camping in the Rub’ al-Khali. From a business perspective, Bob remembers fondly the people he has worked with — especially those who started up GOSPs in the Ghawar area. “It was challenging, but at the same time exciting and satisfying,” he said. For Debbie, the experience provided plenty of opportunities for activities such as the Kennel Club and owning horses, being involved in community fairs and school events, and other activities. The Lumpas can be contacted at 88 San Juan Drive, Ponte Vedra Beach, FL, 32082, or at [email protected].